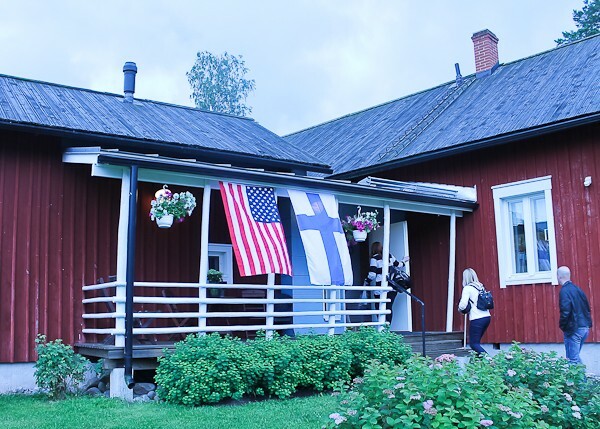 When our family traveled to Finland this past summer and entered the farmhouse filled with relatives, some we had never met, little did I know that I would fall instantly in love with every one of them, but also would learn to make some of the best cookies in the world. What I discovered is that even when two people do not speak the same language and live thousands of miles and an ocean apart, there are two things that will always connect them: love of family and good food. Meet Leena. I love her. I miss her. I wish everyone had a Leena in their life. She spoke no English and I spoke no Finnish, but we connected immediately. It’s like we already knew each other, and we certainly did in the kitchen. Here is Leena making her famous Finnish Slice Cookies. 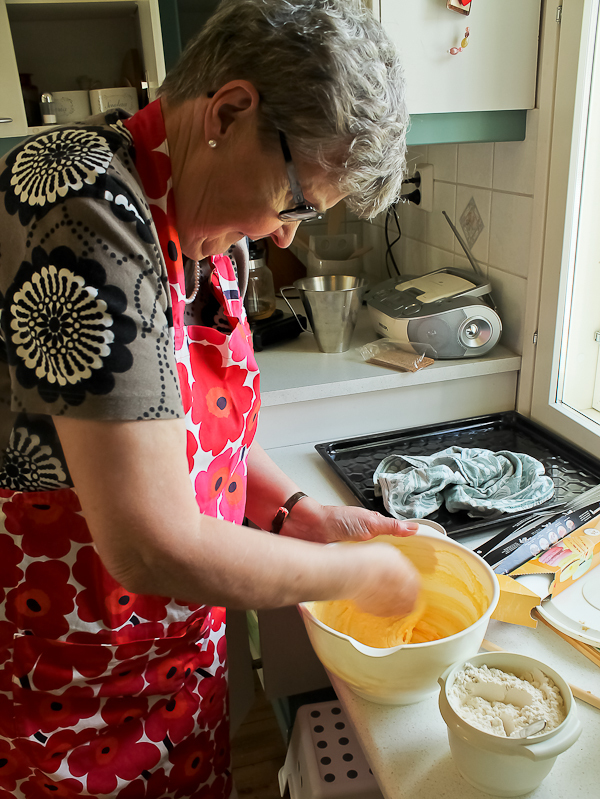 Leena did not use a mixer; the dough was completely mixed with her loving and very agile hands. I’m telling you, she can mix and stir as well as any powerful Kitchen Aid! 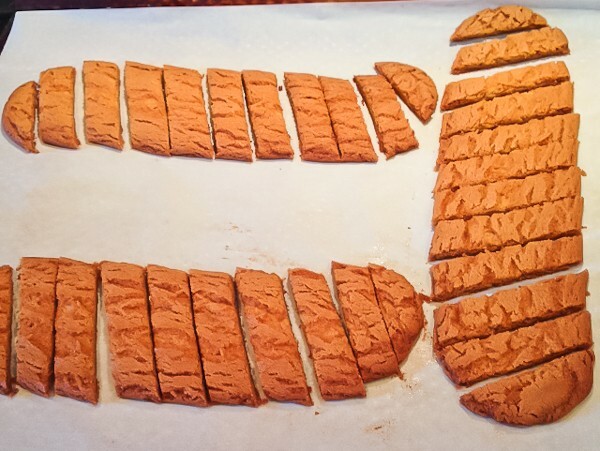 While the logs are still warm, they are sliced on the cookie sheet with a sharp knife into long diagonal pieces, then removed to a wire rack to cool completely. 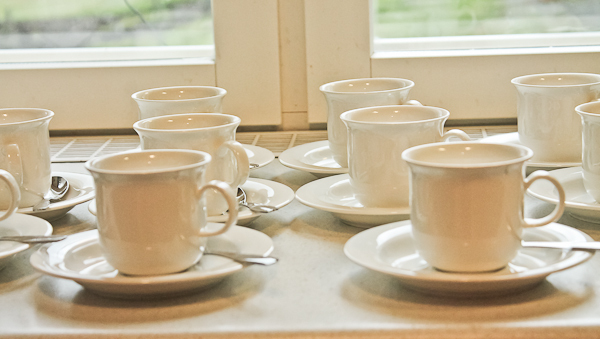 After the cookies were mixed and baked, the counter was then covered in coffee mugs, awaiting coffee time around 4:00. Finns never miss their coffee time, and that was another thing I missed so much when we left Finland. It’s family time every day. Everyone gathers together and eats delicious items like Leena’s slice cookies, or maybe some pulla bread, doughnuts, or other delectables. It’s Finnish happy hour! I have wonderful memories sitting around the cozy kitchen table talking, eating, and enjoying each other. Leena’s Slice Cookies are easy to make but do require one ingredient that makes it special, not readily available in the USA. However, like most everything else nowadays, it can be ordered on Amazon. The ingredient is a syrup called in Finnish Tumma Siirappi. The only way I can think to describe it is sort of a cross between molasses, honey, and Lyle’s Golden Syrup. It has a taste all its own and the cookies will not be the same without it. When not used in the Slice Cookies, it is good on pancakes, waffles, other cookies calling for molasses or honey, or drizzled on ice cream. It is worth ordering! One other ingredient is vanilla sugar, which is a little easier to find at specialty kitchen stores, but can also be ordered online or make your own, which is very easy. (see recipe for instructions). Here are the cookies all ready to eat! 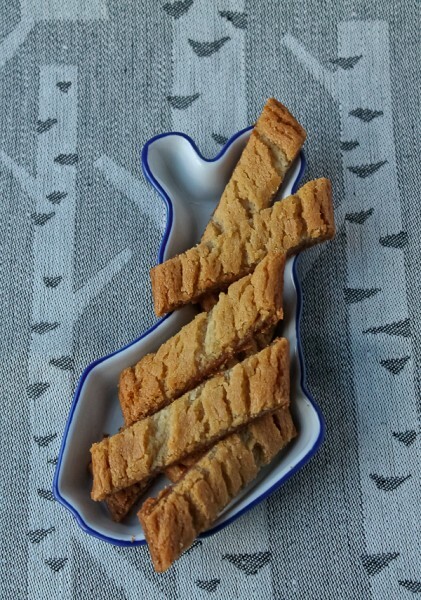 In the second photo, the cookies are in a dish shaped like the country of Finland. I bought two sizes of the dish one small and one extra-large that I am going to have a fun time using for future Finnish foods. 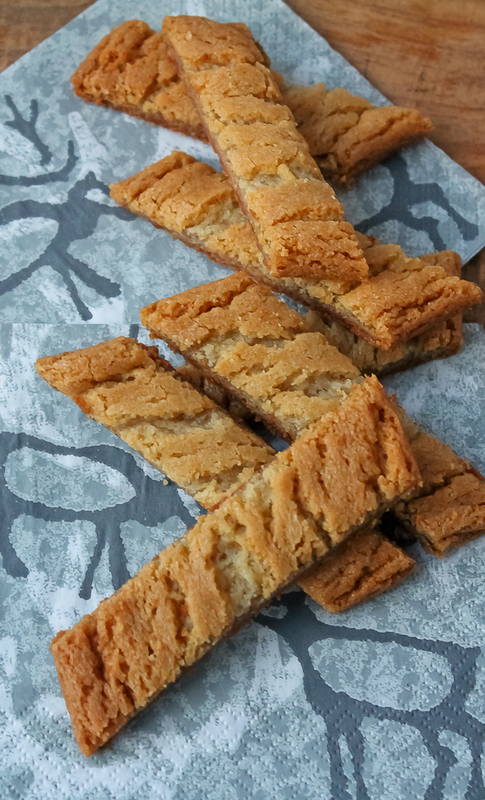 The cookies are crispy, delicate, and full of a warm caramel-like flavor like no other. Addictive. That’s all I have to say. They take me back to Finland and to Leena’s cozy kitchen. I only wish I had what we have now come to call “The Leena Hug.” No one gives hugs like Leena, or makes cookies like Leena. I miss them both more than I can say. *Vanilla sugar can be found in specialty kitchen stores or ordered online; or make your own: after using a vanilla pod with the seeds scraped out, save the pod. Plunge the pod into a container of granulated sugar and let it sit for several days, stirring occasionally. Remove pod and you now have homemade vanilla sugar! 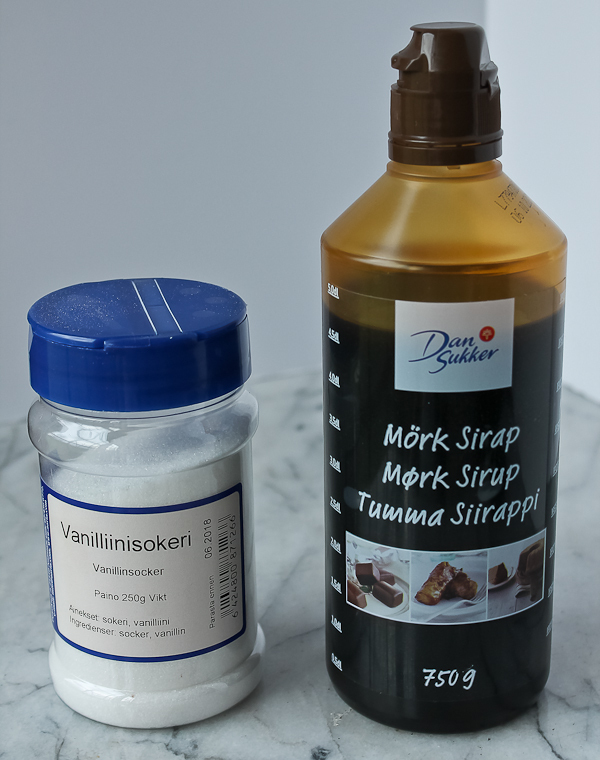 ** The dark syrup called Tumma Siirappi from Dan Sukker can be ordered from Amazon. (I do it all the time!) There really is no substitution for it. It has its own unique flavor. It's worth ordering and is also good in other recipes that call for molasses or honey, or it's good on pancakes, waffles, or drizzled on ice cream. Preheat oven to 375 degrees F. Line 2 large baking sheets with parchment paper. In large bowl of electric mixer, beat together butter, granulated sugar, and vanilla sugar (if not using vanilla extract) until light and fluffy. Beat in vanilla (if didn't use vanilla sugar), egg yolk, and syrup until well mixed. In another bowl combine flour, baking soda, and salt. Add gradually to butter mixture and beat until well blended. Form into a ball and wrap in plastic wrap. Refrigerate about 20-25 minutes or until firm enough to divide into 6 equal parts to roll into logs. Roll each part into a log about 9-inches long. Transfer logs to prepared baking sheets, 3 per sheet. I place 2 logs vertical and one horizontal. Use 3 baking sheets with 2 logs per sheet if your pans are not very large. Keep the logs fairly far apart as they will spread. 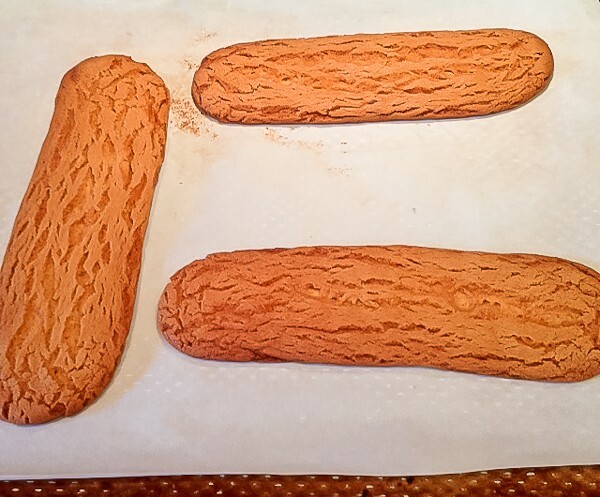 Bake logs for about 12-14 minutes or until a nice golden brown. Remove from oven and place on stovetop. If the logs have touched each other during baking, don't worry, just take a long sharp knife and gently push them back into shape, keeping them oval. While still warm, and using a long sharp knife, cut the logs into diagonal slices about an inch apart. After cut, remove to wire racks to cool completely. I am so happy that you got to have this experience! I know the feeling of meeting relatives abroad and feeling “home”. The cookies look delish. I feel I must order the syrup and give these a try. I hope you will love them, Helen! Would like to subscribe to your site. Enjoyed your sharing and recipe. Loved reading about Leena and her cookies. I might have to order a bottle of that syrup. I always keep vanilla sugar in my kitchen. And if you can’t find it, it’s very easy to make. Just pour some sugar into a jar, tuck a vanilla bean into it, and let it “marinate” for a week or two before using. Madonna, you won’t regret ordering the syrup after you taste the cookies! 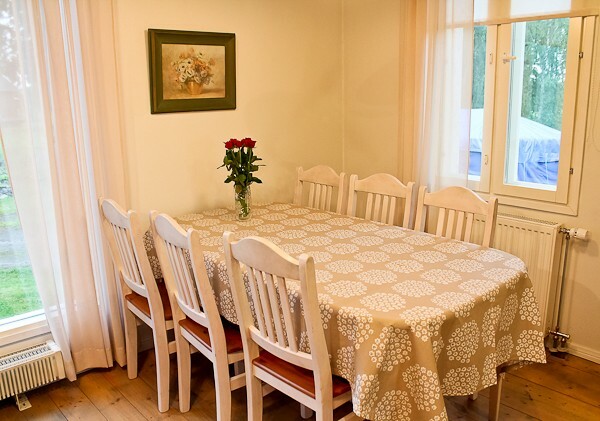 What treasured, warm memories for you in Finland! 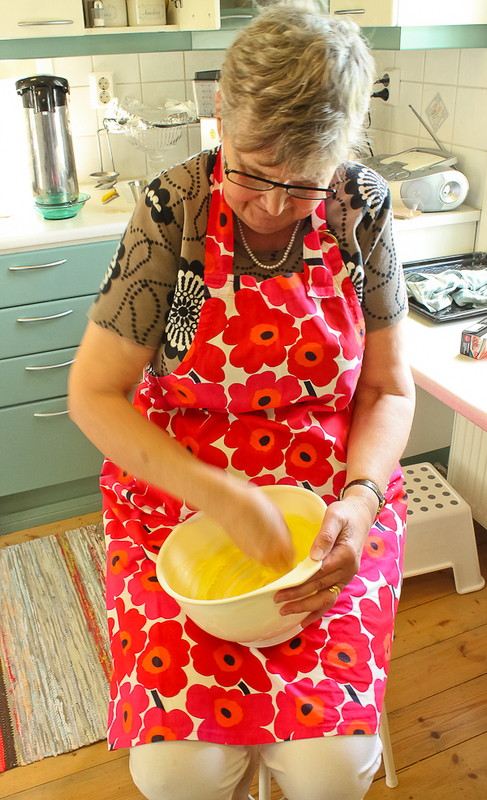 Love your story with dear Leena baking by hand, wearing her lovely Marimekko apron. Makes me think of my dear Finnish Grandma here in the states and all the delightful times we had sharing over a tasty fresh baked treat dipped in our coffee during the ‘Finnish Happy Hour’. Grandma always boiled her coffee the old Finnish way, too, even after we bought her a coffee maker. Somehow she did make everything taste better! Kiitos! There’s nothing like “Finnish Happy Hour!” You are so lucky to have your Finnish grandma here in the states to make you the authentic treats and sit and chat with her. I miss that so much about Finland. Guess what I am baking up today for a 4th of July party–yes, Leena’s Cookies!!! Thank you, dear friend. I can’t wait to hear how you like them! Happy 4th!